Welcome Guest to our Gallery! You can create an account and receive our newsletter and more, login, or just browse our Creations. Please Note: To save your shopping cart for the future, you must Create an Account before leaving our site for an extended period. Here in our Gallery you will find some of the most beautiful beaded jewelry you can imagine, at fantastically affordable prices. 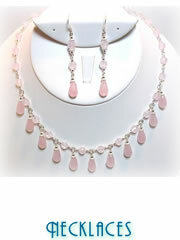 All of our jewelry is designed and made by Siti's Gallery artisans. We specialize in Dangle Earrings and Chandelier Earrings and make a wide variety of jewelry designs from many different high quality materials. We create our jewelry from gold, silver, Swarovski Austrian crystals, Czechoslovakian glass, freshwater pearls, Chinese jade, lapis lazuli, turquoise, onyx, quartz, and other semiprecious gemstones. We will customize any design you see on our website. Most minor customizations such as shortening or changing from ear wire to post can be done quickly and are done at no additional cost. Just find the jewelry Creation you like, then click on "Customize" to make your request. We will reply, usually within one business day, with the cost and shipping details and await your decision on whether to proceed.